This months Daring Bakers challenge was a filbert gateau with praline buttercream. When I first read the title of the challenge I was pleased as it sounded good. Unfortunately as I read the instructions I realized that I would not be able to complete the challenge as it was. The recipe called for grinding hazelnuts into a flour and grinding praline into a paste. I do not have a full food processor and my mini chopper is on its last legs and is not nearly capable of grinding nuts. I decided that I would at least try and come up with something and I was thinking that an almond themed cake would be nice. I had some almond meal on hand and I decided to use that instead of grinding the hazelnuts into a meal. I did not want a large cake all for myself so I cut the recipe in half. I used my 2 small 4 inch spring form pans and 2 ramekins to bake the cake and this allowed me to make 2 small 2 layer cakes. One thing that I have been enjoying about the DB challenges is that there is no shortage of beating in them. I really need to pick up a mixer. For this challenge I fell back to my trusty pair of forks. Continuing with the almond theme I added a splash of amaretto to the simple syrup. This is the third time that I have made buttercream and each time has been easier than the last. This time it came together really quickly. My biggest problem now is trying to not eat it all before it gets onto the cake. Since I would only be doing two layers instead of 3 and since I have no skill in decorating with buttercream I cut the recipe down to a quarter of its original size. I also added a splash of amaretto to the buttercream. The last time that I made a chocolate ganache glaze it came out pretty good with a nice glossy finish but this time it did not work at all. The chocolate ganache was not shiny at all and it had a texture that just would not smooth out. At least it still tasted good. The original recipe called for the praline to be ground into a paste and mixed in with the buttercream which sounded really good. 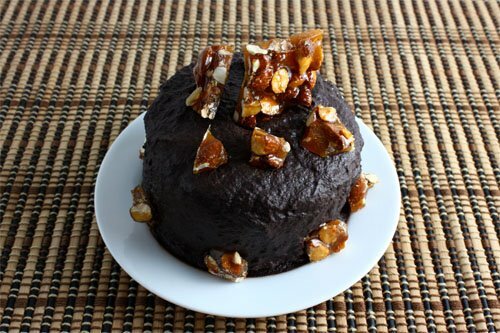 Since I could not grind the praline into a paste I decided use the praline as a decoration on the cake. I went with chopped almonds rather than the hazelnuts. I think that it came out as more of an almond brittle rather than almond praline but it tasted great! I ran into a few troubles along the way but I ended up with a tasty cake. I really enjoyed the almond flavour throughout the cake. 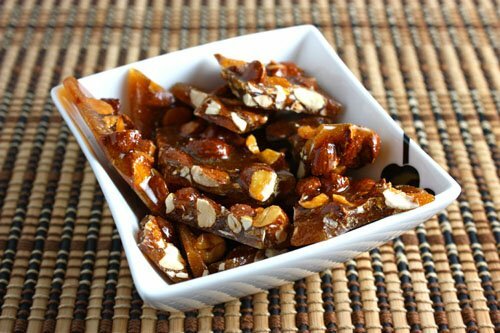 I am really glad that I got to make the almond praline/brittle as it was really good. I am going to have to work on my cake decorating skills. It’s time for me to go and look at all of the other Daring Bakers wonderful creations. Place 1 layer of the cake on your working surface and brush on some of the simple syrup to moisten. Generously spread some of the buttercream onto the cake. Place the next layer of cake onto the buttercream layer and moisten with the simple syrup. Clean up the sides of the cake if any buttercream spilled out. Pour the chocolate ganache over the cake and spread it evenly around the whole cake. Decorate the cake as desired. I used some almond praline. Mix the almond meal, flour and cornstarch in a bowl. Beat the egg yolks until light in colour, about 5 minutes. Mix in the vanilla extract an lemon zest. Beat in the egg yolk mixture. Put the dry ingredients in a mesh strainer and sprinkle it into the egg mixture while folding until almost all of the dry ingredients have been folded in. Pour the butter over the batter. Bake in a preheated 350F/180C oven until a toothpick pushed into the center comes out clean, about 20-25 minutes. Simmer the water and sugar for a few minutes. Remove from heat and add the amaretto. Beat the egg white in a bowl over simmering water until soft peaks are just starting to form. Beat in the sugar and continue to beat until the mixture is warm. Remove from the heat and continue to beat until it cools down. Beat in the butter and continue beating until it thickens. Beat in the vanilla extract and amaretto. Bring the heavy cream and corn syrup to a simmer. Pour the cream over the chocolate and let it sit for a minute. Mix until the chocolate is incorporated into the cream. Mix int the amaretto and vanilla extract. Melt the sugar in a small sauce pan. When the sugar is melted and browned mix in the almonds and bring to a boil. Pour the mixture onto parchment paper and let it cool. Hah, sarcasm duly noted Kevin 🙂 Aren’t simple hand mixers like $10? I think it’s a good investment. I don’t think I could survive making foam-based cakes, buttercream, and whipped cream on just a whisk… Besides, it’s too hot and my cream would have turned to butter if I didn’t do it quickly! I like your amendments to the recipe, I would have left out the butter cream entirely (LOL) and gone with the ganache! Although we eat with our eyes first, sometimes I have made homely dishes that have tasted fantastic … or as I like to tell the food critic “it tastes better than it looks”. The layers look so neat…I love it! Oh my goodness, two forks?? PLEASE go get a hand mixer! You’re making my wrists and elbows hurt just thinking about it. Also, Filbert Gateau sounds like the name of some lowly French lord or something. Love it. And it looks tasty! wow that is a daring baker using forks. I would have given up but great job. your cake turned out beautifully. I LOVE your version of this month’s Daring Bakers Challenge – looks fabulous!! I agree, a hand mixer is a cheap but very efficient investment. You also mentioned that you do not have a food processor. These can be expensive and cheap ones usually don’t do a very good job so hold up on purchasing one until you have done research and can afford a good one. What you can use to grind small portions of nuts is a Krupps spice grinder and it is the perfect size to grind enough coffee for just a couple of cups. While I would not want to grind a couple of cups of nuts this way, it is a very efficient and quite cheap machine for small to medium jobs. 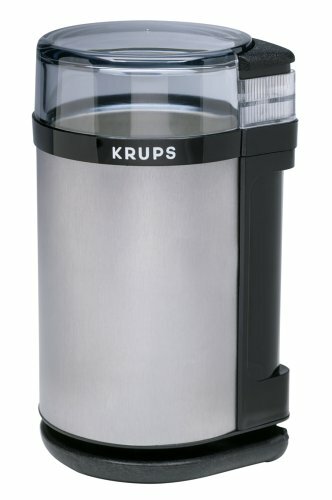 Since you are also into making some of your own spices, you could certainly use the Krupps grinder for that job as well. It has very sharp blades so is very efficient and you can grind coarse or quite fine. I make all my own cloves etc using it. Anyhow, great perseverence to do all this by hand!!! This looks great, and really shows your adaptability. And your dedication – the two forks thing was really over the top! oh what a yummy looking cake…I was hoping you would have a photo of it sliced…and you do!!! Bravo Kevin! 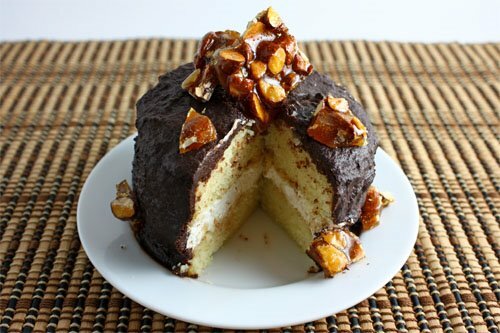 Love your creativity using praline to decorate the cake. Good job, Kevin! You made do with what you had, and it still turned out well! Mmm, hazelnuts are my favorite, but i love the idea of almond and amaretto with it. In my experience, if the ganache gets too hot before pouring, it comes out not glossy and occasionally chunky… I used to be a cake decorator and I had to learn that the hard way when a cake turned out crappy. Wow. No mixer? I was in the middle of a recipe last week and mine died. All the mixing for DBs blew my motor on my cheap model. Let us both as Santa for a Kitchenaid. Great job considering your obstacles. wow! Looks great! I don’t really have a food processer either so I had to make-do with almond flour. Great Job on your daring baker challenge Kevin! It looks wonderful and the praline is a great touch. I just have three letter OMG! this looks, sounds, and probably tastes gr8!! Definitely a fan of the mini-cake. When you’re cooking for fewer than, say six people, mini-cakes are a great idea! It still looks good despite you not having some of the tools … nice work! Kevin, your cake is adorable! Don’t worry about the cake decorating skills, if the cake taste skills are top notch. I’d hate to be without a hand mixer as a fallback to my trusty Kitechenaid; I’ve had one for 30 years that still comes out when I need to beat something over the heat, as you did with these eggs, which I’d have had cooked before they were whipped. This is a glorious effort! Awesome! I can’t believe you whisked everything by hand! You have amazing mixing skills! I’ve been without one all summer and I can’t wait to return to my Kitchenaid. Great job on a beautiful gateau. Beautifully done! That looks amazing! I can not believe you make all these amazing things without proper tools! Soon enough you’ll be able to talk about the days when you didn’t have a proper food processor and managed to submit a totally fine cake. It was a great challenge this month and you did a good job of it. Kevin I can hardly keep up with all your fantastic works of cooking art. I wonder how you find the time to do all these dishes. You really are such a great cook. I always look forward to your newest creations. Looks good to me….I would love a slice of that cake!!!! Kevin, Great job, but how on earth did you make this without a mixer? You need to go treat yourself ASAP with all the good cooking you do here! Kevin this looks gorgeous! 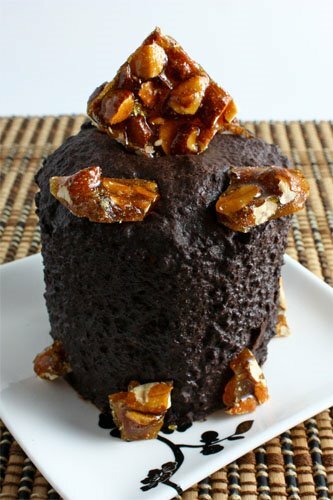 I love the cake and I would not be able to stop eating your yummy praline. I think I need to try the almond next. Kind of similar to the opera cake with the almonds. And kudos to youf ro making do with what you had! Great job. Even though you were not able to do it the way the recipe called for, it still looks fabulous. Good Job! wow!!! you daring bakers are SO daring!! i’m in awe every time!! This looks fabu. “trying to not eat it all before it gets onto the cake” HAHAHA! i’m totally with u…i want to try making the praline…guys…can i grind nuts using a blender instead of a processor? It sounds like a lot of the Daring Bakers either loved this or hated it. I can’t believe you did it all by hand, it looks amazing! that was really great quick-thinking on your feet kevin! and it’s gorgeous. what a lovely daring bakers challenge this is. it’s one reason why i can’t take part in Daring Bakers. i just couldn’t do something like that. oh sigh, what a luscious beauty. Wow, Kevin, those look terrific. I love amaretto. How did you manage to not eat all of these in one sitting? Very cute cakes! Every time I read about you whipping up buttercream with your trusty forks, I shake my head. It makes me tired just thinking about it. Hi Kevin- I loved how your cake turned out! It was quite the challenge it seems without a mixer and all. I wish I could have a piece, I love ganache! The praline looks wonderful as well. I totally get the whole mini processor thing. My tiny one can be useful but it does turn me off attempting recipes that require a full food processor. It looks good – just seems too darn complicated! What?! You have been doing it all with your trusty pair of forks all the while?? Kudos to you Kevin!!!! Nice dark colour! Your cake is gourgeous, Kevin. The cake looks beautiful, but man what a lot of work! So glad you got your work out and made a fab cake. Maybe all of us food bloggers need to join together to get you a mixer!! I still can’t believe you do all of these by hand – you are amazing! Now I would like to eat a piece of this. It looks so good Kevin! I really love the almond prailine – it looks amazing. What is fun about Daring Bakers is seeing everyone’s different interpretation. Yours is great Kevin! I like your rustic manly decorating. I love your cake! It’s very creative! This was my first DB challenge, and I’m having fun looking at all the different cakes made from this recipe. I learned a lot! Looking forward to August’s challenge. I love how creative you are kevin. That is a sign of a really good cook..er chef! Wow, what an involved recipe. Kudos to you for sticking it out sans a food processor and giving it a go. It turned out beautifully! our little cake is so cute, I like the crunchy caramel bits on top. Don’t worry about the ganache, if it tasted great its all it counts! your filbert gateau looks really good! Your photos are wonderful. Even without a processor you’ve done great. Mmmm… I wish I would have thought about decorating with the praline. I bet that added great texture as well as an extra layer of deliciousness. You’ll have to invest so money in a food processor but you did a great job. Really cool!!! I love amaretto!!! Ooo that looks so good! Love the praline decoration! Kevin, I love the changes you made! And the cake looks delicious! This cake is way too cute. I know guys don’t like the word ‘cute’. But coming from a girl, okay an old girl, it is a sweet compliment. The broken brittle on top is very cool. I think the ganache actually looks kinda cool when it’s bumpy like that! like almond meal, you can actually purchase the hazelnut meal too, but it sounds like your cake was delicious anyway 🙂 love how you decorated it w/the brittle!